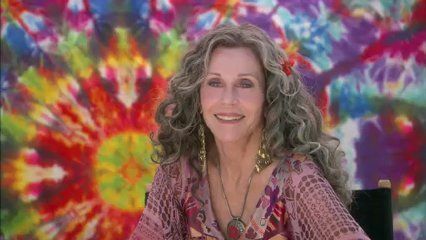 PEACE, LOVE, & MISUNDERSTANDING—–Bruce Beresford erases some good will by directing the ever-evolving Jane Fonda at her most insufferable, as a grandma hippie still living the dream when her uptight daughter Catherine Keener brings sulky teenager Elizabeth Olsen to modern-day Woodstock. Imagine the life lessons. No one went to see this in 2012 (it siphoned in a ungroovy $542,000 before burning out), which gives a glimmer of hope that there are still a few uncooked brains out there. Jeffrey Dean Morgan, Kyle MacLachlan, Nat Wolff, Joyce Van Patten and Rosanna Arquette (barely there) hang loose and relate over 92 minutes. Olsen’s good, but Jane pretending to be an Earth Mother is enough to make you turn into a right-winger. Why don’t I believe you? Is it a vibe thing?